Liangbing Hu, an Associate Professor in the UMD Department of Materials Science and Engineering, has received the 2017 KINGFA Young Investigator Award for his "innovative and significant contributions in several fronts of wood nanocellulose-based technologies to replace plastic, glass, and steel as well as 3D carbon for beyond-Li ion batteries and clean water." Sponsored by Kingfa Scientific and Technology Co., this award is presented to exceptional, young scientists who focus their efforts on chemical technology and renewable materials. This award is provided by the ACS CELL Division Awards Chair. The award comes with a cash prize of $1500 and an invitation to present at the ACS Annual meeting, as well as additional funding for travel costs. Hu, originally from China, completed his Ph.D. at UCLA prior to joining the faculty at UMD in 2011. He has a joint appointment in the UMD Departments of Materials Science and Engineering and Chemical and Biomolecular Engineering, in addition to being a leading member of the Maryland Energy Innoation Institute. Hu has published more than 150 research papers in the field of nanomaterials and emerging devices. 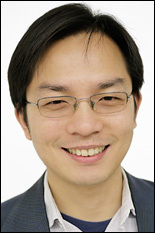 His current research interests include "Nanomaterials and nanostructures; energy storage: battery, supercapacitors for various applications; energy conversion: solar cells, solar fuel, transparent electrode, light-trapping; printed electronics including nano-ink, roll-to-roll printing, flexible electronics (display, touch screen, energy), and wearable devices."